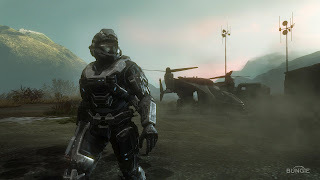 Gears of Halo - Video game reviews, news and cosplay : What music does the Lone Wolf listen to? Halo Reach’s Lone Wolf has his own theme song. You can find out how to download the Reach MP3 here. But what does the Lone Wolf listen to when he’s out in the field? Does he listen to previous Halo Soundtracks? Perhaps he likes the Steve Vai version of the Halo 2 theme? Maybe he’s into Johnny Cash. Cash fought for the man and against the Man – that’s why he was the Man in Black. Perhaps the Lone Wolf shares those views, one man against the Man (or Elite). As an aside, how does an Elite stick it to the Man? He glasses their planet! Perhaps I’ve pegged the Wolf wrong. He might be a loner in the field but a hellraiser at the after party. He could be into ACDC and Metallica. After a hard days work popping grunt skulls, he pops in some Ride the Lightning and eases into party mode with a few burbons and following some advice from Avery Johnson, he gets it on with the lady Spartans cos he knows what they like? Yeah, that's gotta be it. The Lone Wolf is a Metallica fan. No, maybe he likes the Foo Fighters.